After a vacation, it's time to share the Etsy love and get the good karma going again. 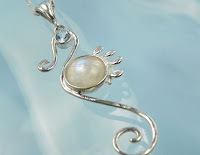 This week's featured shop is Chiron Creations out of Temecula, California. Chiron Creations is a collective, featuring the work of Tracey Giehl, Jim Lathrop, and Jennifer Donnelly. Jim and Jennifer do the crystal-glazed ceramics, a fusion of art and science. Tracey makes the macrame plant hangers, does ceramic painting, and functions as the shop's owner. Have you ever been browsing online and stumble across a photo that just makes you stop and stare? I'm going to share the one that caught my attention the other day on Etsy. 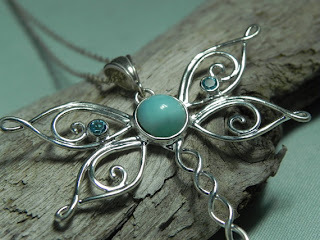 It's a sterling silver dragonfly with blue topaz. I love dragonflies and I grew up on the ocean. 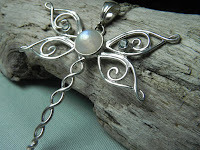 FantaSea Jewelry's Etsy shop is absolutely breathtaking with its silver creations beautifully photographed over driftwood. Please keep in mind that I am shipping from the Caribbean, and although we are part of the US, shipping will still take LONGER than shipping stateside and I have no control over this! Please expect delivery between 5-12 days from the day I shipped your item out. Most items are handcrafted at the time of purchase so please expect 5 days for production. If an item is ready to ship, I will email you and let you know when I receive the order. Thank you!!! You can avoid negative feedback and unrealistic expectations by letting your customers know what your process is like. Some friends of mine recently opened a wonderfully original restaurant and art gallery. Because they make all their entrees and sauces from scratch, it takes some time to get your food. On opening weekend, our server was apologetic about the delay. I later talked to the owner and told her that instead of apologizing, the server should let the customer know that the food is being cooked from scratch at the time of the order. Customers just need to know what to expect. Not everyone is in a hurry and many things are worth the wait. 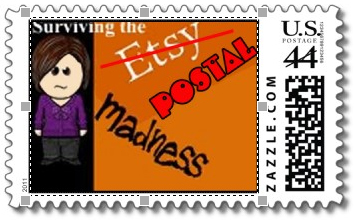 Can't afford to advertise your Etsy shop? Neither can I. Fortunately, the growth of social media has provided some great opportunities to share information for free. Right now I have a Facebook page for this blog, but I haven't set up a separate one for Native & Pilgrim. 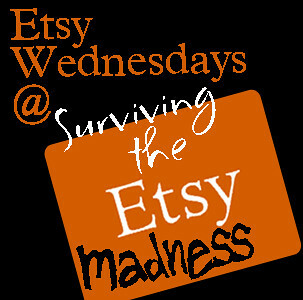 The Etsy Madness page basically serves to promote the blog and the shop. Worried about the time investment of an additional Facebook page? It doesn't have to take a lot of time. 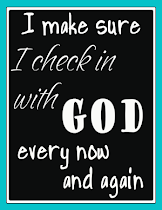 I post the latest blog articles by clicking the button below the article to share on Facebook. Etsy has also made it easy to share your product listings on Facebook. I wouldn't necessarily post every item in your shop on the FB page, but posting new creations, sale items, and holiday-specific items will keep your fans connected. Make sure you do some status updates about what you're working on or asking questions of your customers so its not just product promotion. Mashable recently posted this article on hot tips for small business marketing on Facebook. I recommend following Mashable for their posts on technology. Another great article comes from Outright's blog, The Bottom Line. Justine Smith shared the top 10 marketing tips from full-time Etsy sellers. You may have heard some of these tips before, but I like having a refresher and each person will explain it a little bit differently. Some of you have probably already noticed the latest rate increase from the US Postal Service (USPS). This rate increase happened on January 22, 2012. Although the difference in rates isn't huge, it will certainly add up as you ship multiple packages. If you haven't done it already, head over to your Etsy shop and update the shipping charges for your items. I used to use the Craftopolis website to quickly edit prices and shipping charges. They're renovating their site right now, so I'm going to have to make the edits on Etsy. One of the easiest ways to handle your shipping amounts on Etsy is to create Shipping Profiles. 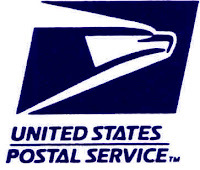 Go to https://www.etsy.com/your/shops/YourShopNameHere/shipping/batch. You can created and edit shipping profiles there. 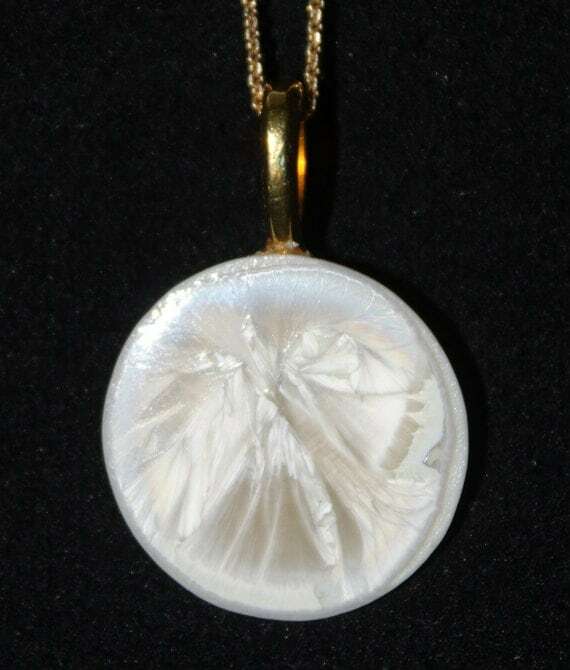 I have one for digital items (free shipping), one for very small items (1 oz or less), and one for items that are a little larger and need more packaging. You'll choose all the same options you would when listing a new item for your shop. Once you save it, you'll be able to select that shipping profile when listing or editing items in your shop. Over time, this will be a great shortcut. On the shipping page, you can apply shipping profiles to many items at once. The only negative I've found is that changing the dollar amounts in the shipping profile doesn't change anything in the items in your shop automatically. For example, I decide to change the shipping profile for very small items. The shipping charge is now $2.25 instead of $2.00. I will now need to go in and edit the item listings to apply that shipping profile. Shipping information for items doesn't change until you apply the updated profile. That's definitely an area that Etsy could improve on. Please share any tips on making this an easier process. Good luck!